air joe is proud to serve the Naperville community! We are proud to be a part of this community, serving your heating and air conditioning needs: air joe is listed in many directories under titles such as : Naperville Heating Contractors, Naperville Heating, Naperville Air Conditioning, Heating Repair, Air Conditioning Repair, Naperville Heating and Cooling Contractors, Rooftop HVAC Repair, Ductless AC Systems, Boiler Repair and Naperville Heating and Air Conditioning Contractors. We are here for you whether you need furnace or air conditioner repairs, heating and cooling estimates, equipment replacement or new installation of a furnace, air conditioner, heat pump, rooftop heating and cooling or comfort products to improve the air filtration for your home or business. About Naperville, IL - Happy to be your hometown Heating & Air Conditioning Contractor! The vibrant, thriving city of Naperville is located in the Illinois counties of Will and DuPage, approximately thirty miles southwest of metropolitan Chicago. Home to a population of more than 145,000 residents, the city boasts nationally acclaimed public and private schools, a diversified business base of technology firms, retailers, and factories, and one of finest public library systems in the nation, as well as easy access to public transportation, world-class parks and recreational facilities, and a variety of housing options. Rich in history and culture, Naperville is home to numerous historic homes and buildings, many of which are listed on the National Register of Historic Places. The Naperville Historic District features more than 300 historic properties that include the circa 1916 Truitt House, former home of prominent Naperville physician Dr. R. L. Truitt, and Naper Settlement, an outdoor history museum featuring an historic 19th century village with exhibits and collections of historical facts and memorabilia, a reference library, and realistic reenactment by costumed villagers of daily life in the 1800s. 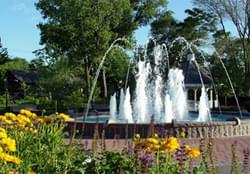 Patrons of the arts will enjoy visiting any of the numerous museums, concert halls, and theaters located throughout the city, while outdoor sports and recreation enthusiasts can spend time at any of the award-winning parks and recreational facilities operated by the Naperville Park District, such as the celebrated Naperville Riverwalk and Centennial Beach. It’s easy to see why the city of Naperville consistently ranks among the top communities in the nation in which to live, work, raise a family, and retire!